This is a recent photo sent to me by a very kind person at the First Corinthian Baptist Church, formerly known as the B.S. Moss Regent or the RKO Regent Theater. The First Corinthian Baptist Church has taken beautiful care of this building, a building that holds a few important places in New York and motion picture history. The plaster work around the proscenium looks incredible, as does the detail on the boxes. Thank you First Corinthian Baptist Church for realizing the beauty and value of this building and taking care of it. 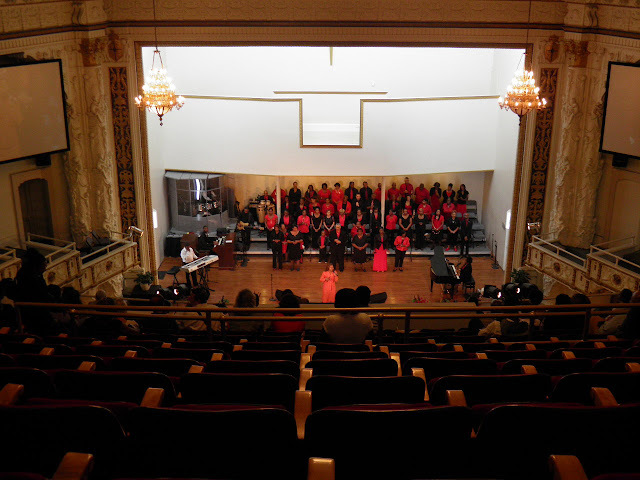 The theater is about to turn 100 years old (February 2013) and the image above with the musicians on the stage is a full circle of the life of this space. It was a failing movie house until Samuel .L. Rothafel took over management. Better known as "Roxy", he had been successful with turning the fortunes of unsuccessful theatres in other parts of the country. In the theater prior to the Regent, prior to moving to New York was the Alhambra in Minneapolis were he covered up the orchestra pit and moved the musicians on stage. When the theater owner objected, Roxy's response was "well they're expensive, right? Might as well see them" or something to that effect. Roxy had a a set built surrounding the screen above the orchestra with balconies for singers. Roxy arranged music specific for the film being shown along with lighting effects. As the years went on, his shows and orchestras grew, eventually to the 110 musician Roxy Theatre Orchestra. It is here that Roxy got his start in New York. It was the first theater to be built for movies (however it did not differ much from the vaudeville house typical of 1913 - meaning it had a stage) and it is one of the most beautiful, intact houses by Thomas Lamb.